As good as it gets in Matapouri! Enjoy two awesome Kiwi style Bach’s on one fantastic property that provides accommodation for up to 14 people. With beautiful Matapouri beach just a 200m walk to the end of the road, and the dairy (corner store) right around the corner, this is the perfect spot for a family friendly getaway. Both properties face a large flat lawn, great for summer games and lounging in the garden enjoying a BBQ. The main house has open plan living, and comfortably sleeps 5. The bach is modern with open plan living and sleeps 9. These charming self contained Bach's are set up for families and large groups wanting a break together, but are equally ideal for a couples escape. A typical Kiwi bach experience with a few mod cons, this is the perfect escape from the city. Book now to experience a quintessential New Zealand beach holiday! House – Open plan, 2 bedrooms, bathroom with shower, WC and laundry. One queen, one bunk and one queen – sleeps 5 in total. Bach – modern, open plan, 2 bedrooms, bathroom, laundry. One Queen, one Bunk single over double, two sofa beds in lounge – sleeps 9 in total. Hello we would like to introduce ourselves. We are Coastal Holiday Homes and are your local Holiday Managers for this property. Once you have made a booking, we will be in touch with you to finalize your booking. We will then Confirm Acceptance of your booking through HomeAway. We will then be able to provide directions, address and key location to the property you have booked. 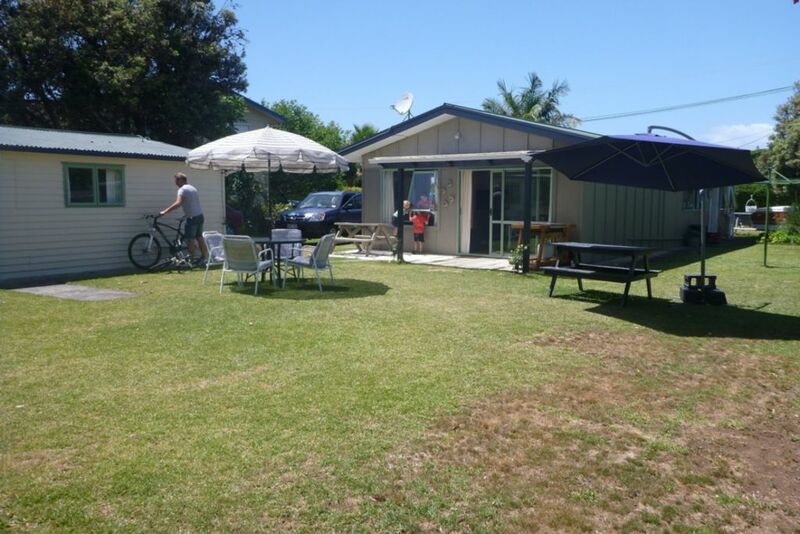 With beautiful Matapouri beach just a 200m walk to the end of the road, and the dairy (corner store) right around the corner, this is the perfect spot for a family friendly getaway. We were only given one key code for 2 dwellings please refer to your email. Just as well the key in 2nd cottage fitted the house. We hope you enjoyed your stay. Please refer to the email sent on the 28th February 2019 through Homeaway which had three attachments and the key code for the house and sleep out were attached along with the directions. Great location and perfect property for a get-away trip! It was an amazing place, very near to the beach and heaps of things to do around. Great set up for groups or families.